According to Tokyo Kantei, the average asking price of a 70 sqm (753 sq.ft) second-hand apartment in greater Tokyo was 37,290,000 Yen in December 2018, up 0.5% from the previous month and up 3.2% from December 2017. The average building age was 24.3 years. In Tokyo’s 23 wards the average asking price was 54,610,000 Yen, up 0.4% from the previous month and up 2.3% from 2017. The average building age was 24.1 years. 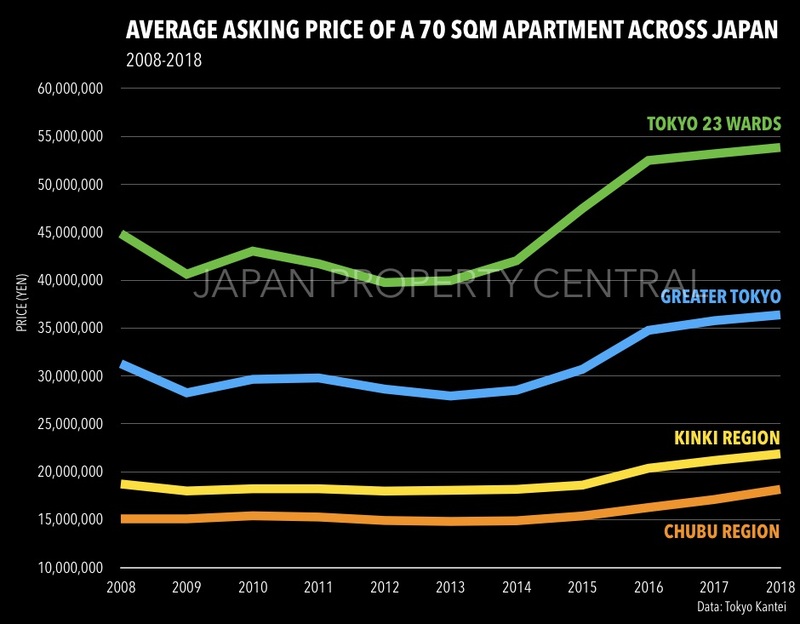 In central Tokyo’s six wards (Chiyoda, Chuo, Minato, Shinjuku, Bunkyo and Shibuya) the average asking price was 76,010,000 Yen, up 0.6% from the previous month and up 3.2% from last year. It has also exceeded a previous price record set in August. The average building age was 22.6 years. In 2018 the average asking price across greater Tokyo was 36,380,000 Yen, a 1.7% increase from 2017. The Kinki region, which includes Osaka, saw a 3.3% year-on-year increase, while the Chubu region (Nagoya and surrounds) saw a 6.1% increase. Asking prices in Tokyo’s 23 wards increased for the 6th year in a row to 53,850,000 Yen, up 1.3% from 2017. The average price is now up 32.6% from 2009, while the average age of a building listed for sale has increased from 18.1 years in 2009 to 23.5 years in 2018. Source: Tokyo Kantei, January 24, 2019.